The National Popcorn Day - one can say belongs to "Bizarre, Wacky and Unique Holidays" - is celebrated on 19th of January, although its exact date is still debated. Various sources report it as being on January 19, while others claim that it takes place on whatever day the Super Bowl falls on. And I'm sure that Popcorn Day can be celebrated anytime as part of our funny or bizarre moments in life, when we are taking part to unique holidays, special events, occasions or celebrations. These are favorite pastimes as well as nowadays times of the United States citizens - and to have a January Celebration Popcorn Day - make sure that you have bowls and balls of this favorite treat all around. Popcorn is the American snack food associated with movies theaters, fairs, ball games, picnics and circus shows. You can have the standard topping of salt and butter or be more creative with different sweet toppings. Try caramel corn, cherry jelly, cheddar cheese, and the like for a creative flair. Don't forget the "corny jokes" today, as well. Popcorn was first discovered thousands of years ago by Native Americans in North America. It is one of the oldest forms of corn – evidence of popcorn from 3600 B.C. was found in New Mexico. The English who came to America in the 16th and 17th centuries learned about popcorn from the Native Americans. During the Great Depression, popcorn was comparatively cheap at 5 – 10 cents a bag and became popular. Thus, while other businesses failed, the popcorn business thrived and became a source of income for some struggling farmers. During World War II, sugar rations diminished candy production, causing Americans to eat three times more popcorn than they had before. At least 6 localities (all in the Midwestern United States) claim to be the “Popcorn Capital of the World”: Ridgway, Illinois; Valparaiso, Indiana; Van Buren, Indiana; Schaller, Iowa; Marion, Ohio; and North Loup, Nebraska. According to the USDA, most of the corn used for popcorn production is specifically planted for this purpose; most is grown in Nebraska and Indiana, with increasing area in Texas. Rainbow colored popcorn Popcorn “snack” is usually served salted or sweetened, and sometimes spiced up (especially in India). In North America – traditionally it is served salted, often with butter or a butterlike topping. However, sweetened versions, such as caramel corn and kettle corn, are also commonly available. The Boy Scouts of America sell popcorn door-to-door as a primary fundraiser, similar to Girl Scout cookies. In Peru – popcorn is, sometimes, sweetened with small candy pellets and sweetened condensed milk, but it’s more often eaten with salt and the only buttered version known to any considerable degree is the microwave popcorn. In the United Kingdom – ready-made popcorn is available either salted or simply sweetened with sugar. Toffee (i.e. caramel) popcorn is also available, but tends to be more expensive. In Romania – homemade and ready-made popcorn is commonly found salted (often with butter) and sweetened with sugar or honey, topped with caramel, fruits jelly sorbet or chocolate, and you can find it on movie theatres, super-markets or at flea market (usually on a stick, having a ball shape, covered with small candies, or sweetened with colorful jelly fruits (like a rainbow) or caramel – it’s not quite healthy but a delight for kids outdoors, while taking a long walk into a Park or visiting a Zoo). As nutritious value – air-popped popcorn is naturally high in fiber, low in calories and fat, contains no sodium, and is sugar free. Health risks – Popcorn is included on the list of foods that the American Academy of Pediatrics recommends not serving to children under four, because of the risk of choking. Special “hull-less” popcorn has been developed that offers an alternative for small children and for people with braces or other dental problems who may otherwise need to avoid popcorn. Popcorn can also have non-food applications, ranging from holiday decorations (like Christmas trees, bracelets for kids, etc) to packaging materials (for shipping various fragile items). 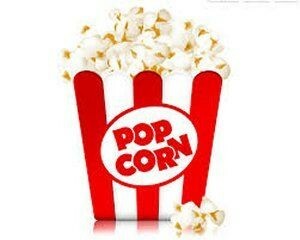 Martin Lawrence quote about popcorn - "Enjoy your popcorn and enjoy the jokes. Its just a movie, so have fun!" Did you know about popcorn? The world's largest popcorn ball was unveiled in October 2006 in Lake Forest, Illinois - it had 3,415 pounds (1550 kgs), 8 feet (2.4 m) in diameter, and 24.6 feet (8 m) circumference. Patricia Linden quote about popcorn - "Popcorn [is] the sentimental good-time Charlie of American foods." - If wondering what snack to take while watching a movie, at a pajama party or any occasion... No doubt, chose popcorn, instead of chips!